An EC225 lost it's main rotor last night enroute from a gas rig at Gullfaks oil field to Bergen in Norway. I am saddened and frightened by the news. RIP Pax and Crew. Footage of just the rotor system falling from the sky. I know I'll never get anywhere near great machines like them, but now I'm kinda glad. Feel for those lost and those that are effected directly and indirectly. Absolutely tragic. RIP to the poor souls on board. Capt Hollywood wrote: Footage of just the rotor system falling from the sky. That is chilling. Sad indeed. A terrible and tragic day for the broader helicopter industry and more specifically those engaged in the offshore sector. The footage of the main rotor flailing back to ground level is physically sickening and terribly sad to watch. As a fellow offshore worker I extend my sincere condolences to those family members who have loved ones that have perished in this accident and my thoughts are with those colleagues and friends left behind. Its just tragic, and sobering to say the least... Thinking of the families involved and also my colleagues on type. 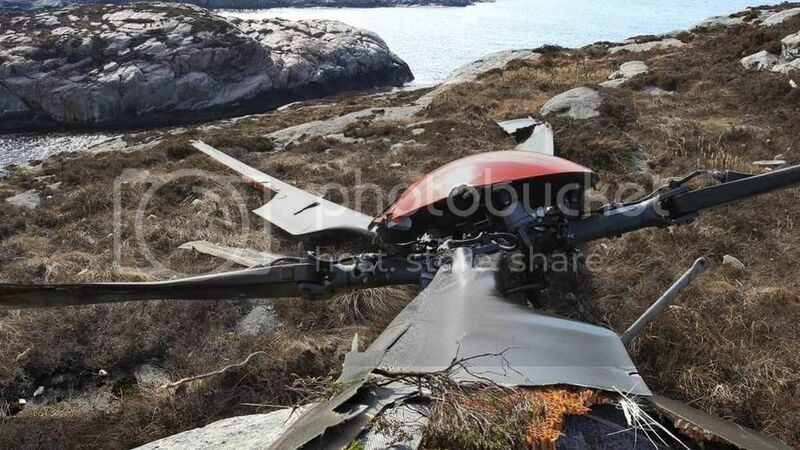 Airbus Helicopters regrets to confirm that a H225 operated by CHC was involved in a fatal accident off the coast of Norway near Turoey outside Bergen on Friday 29th April. Preliminary information obtained indicates that the helicopter was flying from Gullfaks B oil platform and was carrying a crew of 2 people plus 11 passengers from Statoil ASA. Latest reports state that 11 people have died and two are missing. Airbus Helicopters and all of its staff are deeply affected by this tragic accident. We share the pain of the families, friends and colleagues of the victims. At this point in the investigation, we do not have any information that allows us to understand the causes of the accident that involved the aircraft’s rotor being detached, nor to make any links to events that have occurred previously. Airbus Helicopters is participating in the on-going investigation and two technical experts are currently on their way to Norway to provide their assistance to the local authorities. In the frame of the investigation, information related to the background of the aircraft is being gathered. The preliminary elements of the inquiry should become available in the coming days. Under these tragic circumstances, and until these elements are available, we are allied with the decision taken to put all commercial EC225LP passenger flights on hold. So does this signal the death knell for the H225 in the oil & gas sector ? Doubt there are many operators who will be keen to put workers on it after all the recent issues. Unfortunately this accident will have a lifelong effect on the surviving families, such is the legacy of a helicopter accident. The horror of it is not so great on the victim, it is a momentary thing, but is relived by the loved ones for their lifetime. I can imagine the Airbus people will also be genuinely feeling this as will colleagues, so the press release is most likely heartfelt. I find it hard to even look at the rotor photo that Hollywood has posted. Yep, gotta say, that spinning main rotor was quite unnerving to see. Having a rotor assembly separate from my helicopter is not something I ever wish to see. Thoughts are with the poor families. Rumor is ACFT underwent a transmission change about 4 months ago. In this day in age and the caliber of that type of machine, how and why can this type of event happen? Shame on someone.. In my eyes, it's the worst possible catastrofic event/ failure a pilot and pax could ever experience. And condolences to the family's involved. Last edited by Birdy on Mon May 2 2016, 08:36, edited 1 time in total. OK all can we PLEASE treat this thread with a little decorum? 13 people have lost their lives in this terrible accident. There will be a lot of speculation for a long time to come in online forums and in the media, prune is already over 11 pages on this subject and well into a slanging match. The relatives of those that have perished will be looking for any and all information about the accident until such time as they have answers about what happened and what took these people away from their loved ones. Their searching may bring them here so I'm asking that we show a little sensitivity in the language we use. I am a 225 rated pilot and I have also been affected by the loss of a loved one in an aviation accident in the past so I am possibly a little sensitive on this issue myself. Is it worth splitting the thread into a condolence thread and a accident causation thread? I think that was how the dark side handled the Scottish Police 145 accident. Friendly Black Dog wrote: Is it worth splitting the thread into a condolence thread and a accident causation thread? Good suggestion FBD. Please refer to new thread titled EC225 Accident, Norway - Discussion thread. Your right ET, i should hold my tongue.